Like a Tripit for shopping, TechCrunch Disrupt alumnus Shwowp is opening to the public today, under a new name and after a complete site redesign and rebranding. Shwowp co-founder Tara Hunt tells me that the post launch feedback for Shwop’s original branding wasn’t good, but the tipping point was when the site won a “Worst Brand Name of 2010” award from blog Eatmywords. Ouch. But instead of getting down in the dumps or being stubborn, Hunt did what any founder committed to growing their business should do, she wrote a blog post inviting people to come up with new suggestions. While the survey brought in over 3000 pageviews and over 1200 suggestions, none of them were quite the right fit. Thankfully the original Eatmywords blogger Alexandra Watkins stepped in, and came up with the name Buyosphere which is sort of perfect, in a punny sort of way. “I instantly envisioned the site as an ecosystem of people expressing their individual tastes,” says Hunt. The only problem is that the bootstrapped startup didn’t have the cash for the Buyosphere domain, which was being squatted on. Hunt wrote the site owner an email, explaining the (sob) story, “I was like, I have 500 bucks,” she said. Needless to say he took her offer. Now the personal Buyosphere site profiles are called Buyographies, the data analysis of what gets bought is called Buyometrics, its new blog is called the Buyble and the search and product discovery is called Buycuriousness (Okay so I don’t know about that one, but Hunt has plenty of time to work out the kinks). 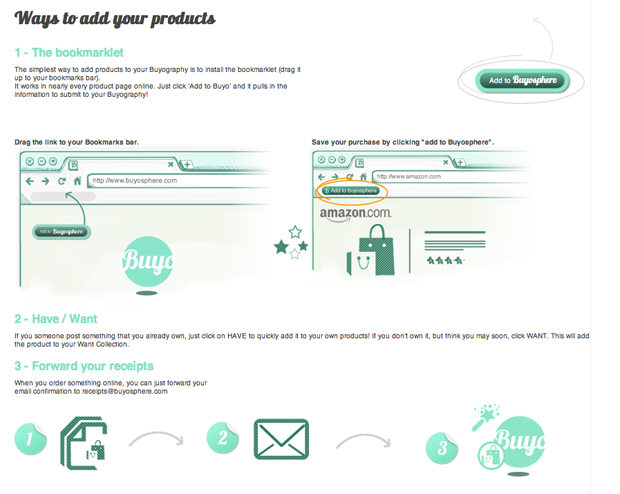 Users can easily add their products and stories (separated into “Haves” and “Wants”) via a Bookmarklet, forwarding an email with a purchase receipt or by clicking Have or Want on an item you see someone else post. You can follow users manually or find friends who are already on Buyosphere through Facebook and Twitter. 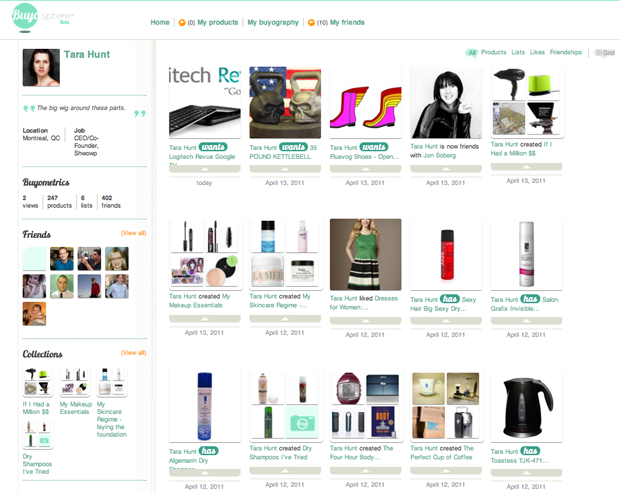 Users can also create collections or lists of items they have or want like “Dry Shampoos I’ve Tried, “The Four Hour Body Toolkit” and “If I Had A Million $$” and share them with friends on Buyosphere, Facebook and Twitter. 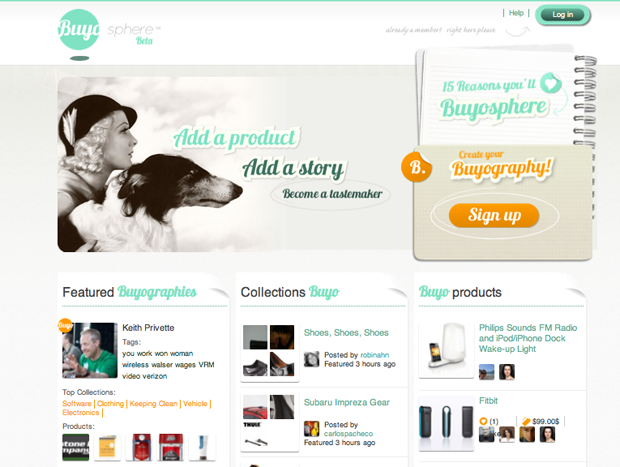 You can see a list of featured Buyographies, featured lists and products on the Buyosphere homepage. Hunt tells me that Buyosphere is currently in its data gathering phase, and that the grand vision is to be like a Mint specifically for purchases. Hunt plans on using the data to provide recommendations to users, and because all the data is personal and based on you actual purchases, Buyosphere was the potential to do a way better job guessing what you like than cookie and web tracking software like Bynamite. iPhone and Android apps are also in the works. Buyosphere is currently bootstrapped and looking for funding.